I’ll never forget my last visit to the plastic surgeon’s office many years ago. I sat on top of the exam table facing the two kind gentlemen who had carefully put my beautiful face back together after I almost died in a car accident on my 17th birthday. After a brief silence, I stood up and gave each one an epic bear hug from the deepest part of my soul. I don’t know how long we hugged, I just knew it was important and it felt good. I didn’t really know the doctors that well, except they were always sweet and kind to me, and deeply compassionate. I felt like they really knew me. After all, they had seen me through some of the toughest times in my life, when I was raw and emotional and ugly and beautiful. And hugging them in that moment felt perfectly normal. Physicians and healing practitioners like you do such important work. As you move into the new year, think about how much your patients love and appreciate you. And think about giving them a hug in return. Simply put, when we hug someone, it feels pretty amazing, right? The hormone oxytocin is released, making us feel all warm and fuzzy inside. “Oxytocin is a neuropeptide, which basically promotes feelings of devotion, trust and bonding,” DePauw University psychologist Matt Hertenstein told NPR. In other words, hugs connect you to your patients, improve patient outcomes, build trust and elevate your practice. Yup and there’s science behind it to back it up. #4 Hugging is important for adults, too. 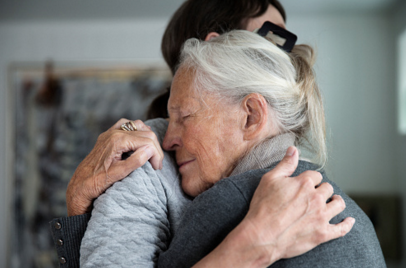 According to researchers at Ohio State University, hugging and physical touch becomes increasingly important with age. “The older you are, the more fragile you are physically, so contact becomes increasingly important for good health,” University psychologist Janice Kiecolt-Glaser told USA TODAY. By hugging someone, we instantly feel closer to that person, and chances are your patient (like me) will remember that hug for years to come. Wishing you the brightest and best year EVER. P.S. There are six critical transition points in the life of your healthcare practice, clinic, or facility where a new design will produce outsized results. Learn more.